Have you ever wondered what the numbers on Tarot cards mean? What if you have many of the same numbers or two or three of the same number in a row? 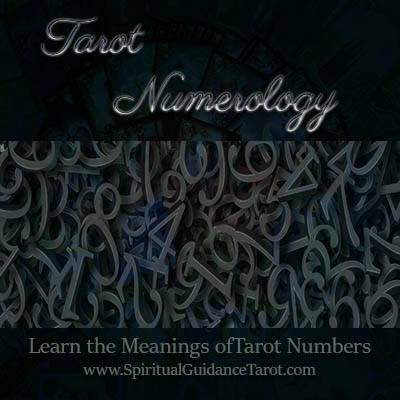 Numerology does play a strong secondary role in the Tarot and this post will explain what that is and what the different numbers mean. Every Tarot card has a number. The major arcana has roman numerals from 0 to 21 or from 1 to 22 depending on the deck you use. In the minor arcana, the Aces signify the number 1. There are cards 1 – 9 and then four court cards. When looking into repeat numbers and multiple number patterns in a spread these tend to be the cards I pay the most attention to. Let’s say you have a 5 card spread and in this spread, you have two cards with the number 3 on them. This means that the number 3 is dominant in that spread and you should also consider the numerology meanings of this number as well as the overall theme of the card itself. Sometimes this will stand out ever further. What if you do a spread and draw three 3’s in a row? Not only do you have 3 of the same numbered card “3”, but also in succession. Wow, that doesn’t happen often, but it would be a definite clue that the number 3 is playing a big secondary role in that reading. So, to further enhance your Tarot knowledge what follows is an overview of the numbers in Tarot and what they signify. Consider these meanings when you see certain numbers pop up in abundance. I also have posts that cover each number in more detail. I treat Tarot numbers as I do Numerology charts. In numerology, we break down a number until it is a single digit. So for example, say you draw the Devil card – his number is XV which is 15. In numerology, we would add the 1 and 5 together to reduce down to a single digit: 6. If you had the Devil card in your spread and a couple of the six cards from the minor arcana you’d also consider the meaning of the number 6. Number 0: This is the absolute beginning “nothing” and “everything” all at once, the alpha and omega. Zero is the absolute place of potential where anything can happen and a course of action has yet to get underway. 0 is the individual as they are at the present moment, brand new, no expectations or preconceived notions – it just is. There is only one 0 in a Tarot deck. Number 1: The number one represents the absolute beginning stages of a venture or process. It also symbolizes individualism, independence, and self-worth. One is the number of expressing one’s unique thoughts and ideas. Newness, potential, the seed of that which has yet to develop. Properly balanced this is a card of ideas and initiative and recognizing personal value, imbalanced it is a card of arrogance and difficulty putting ideas into action. Number 2: Two speaks of choice, being at a crossroads, having to make a decision. Which path? Sometimes this number in abundance can indicate feeling confused or uncertain which choice will bring the most rewards. Two also represents polarity and learning to unite opposites. Properly balanced it speaks of finding peace and harmony a good blend. Imbalanced two’s speak of indecisiveness, victim mentality, and/or failure to make strong choices. Number 3: Three focuses on communications, group dynamics, and expressing yourself in meaningful ways with others. Three is a card of multitasking and being well rounded through different experience. Properly balanced 3’s are social and great communicators, imbalanced 3’s can use others or abuse friendships. Number 4: Fours speak of hard work, practicality, being in the “nitty gritty” phase of a project. Four is hands on, logical, analytical and sequential. Four is a very serious, matter of fact approach to problems. In proper balance they speak of hard work, dogged determination and perseverance. When imbalanced they speak of rigidity and being overly controlling or manipulative. Number 5: Five is the number of adventure and changeability. Never a dull moment with five’s, but they are sometimes chaotic or scattered. Five speaks of loving attention and adventure and being impulsive and spontaneous. When properly balanced five’s are great adventurers and risk takers, when imbalanced they are reckless and impulsive. Number 6: Sixes are conventional with a strong sense of duty to family and service to others. Six has a strong need to be needed and to prove themselves to others. Six tends to be more of a traditionalist number and sometimes overly simplistic or too “black and white” when improperly balanced. Number 7: Seven is a number of wisdom, truth seeking, the subconscious. Seven refers to introspection and looking for what lies beneath the surface. Seven is a number of solitude, reflection, philosophical thoughts and ideas. Properly balanced it is wisdom, insight, and inspiration. Improperly balanced it can be a card of seclusion, becoming detached or reclusive, distrustful of others. Number 8: Eight is the number of personal power, ambition, and being very goal oriented. Expansion, the “Midas touch” and ability to manifest wealth and prosperity. When properly balanced nothing will get in the way of an Eight. Eight can be overly ambitious and become self-centered and destructive of others when not properly balanced – must win at all costs. Number 9: Nine is the number of the humanitarian, it is compassionate, idealistic and dreamy. Nine’s speak of a higher vision and purpose – moving beyond limitations and into new potential. A well balanced nine is a philanthropist and driven by the need to create a better world. An imbalanced 9 can indicate playing the martyr or being kind for selfish needs rather than purity of heart. Learn more about Numerology at Soul Numerology This site features free Numerology lessons, free readings, and information on how to do numerology charts for self and others.